Kia Ora & Welcome to New Zealand! Welcome to the Holiday Parks New Zealand's website. Holiday parks provide New Zealand's best leisure accommodation, whether you are a backpacker, a couple or a family on holiday. New Zealand holiday parks are found in the country's most beautiful locations. Holiday Parks are your best option for accommodation when exploring Middle Earth - New Zealand. Holiday parks offer a wide variety of accommodation options, from camping sites through to self-contained apartments and cabins. They are well known as providing an authentic New Zealand holiday experience. 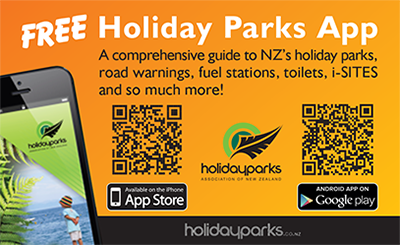 Holiday parks in New Zealand are open all year round. On behalf of our members, we wish you an enjoyable New Zealand holiday park experience. Enjoy the opportunity to meet great people at our parks -we're sure that you will have a wonderful time!